The Plough and Harrow has hardly changed in the many hundreds of years that it has been standing. The building itself dates back to the fourteenth century, with many original features remaining including the ceiling support beams hauled from the beach from wrecked ships. The Plough is a, “proper pub with real ale, real food and real people” and is regularly voted one of the best pubs in Wales. The Plough has had a reputation for a warm welcoming atmosphere and the finest real ales. The Walk – You can either enjoy a long walk or drive to the pub. 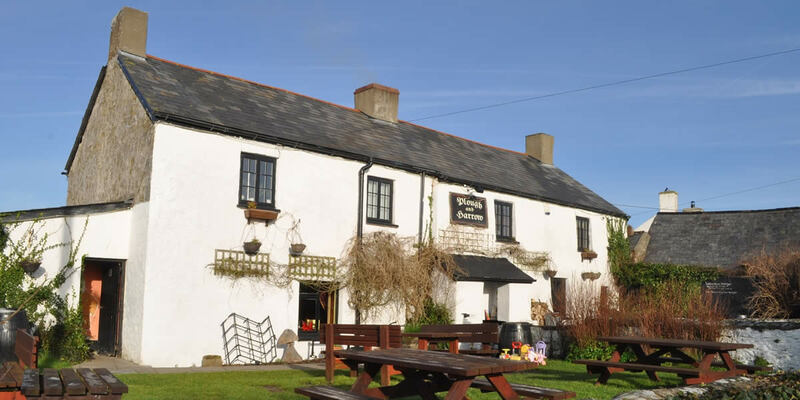 The Plough and Harrow pub is within the Hertitage Coastline only 3 miles from Hide. From the Carpark, the walk starts on a small lane narrowing though an arboretum – peering out of the woodland – agassed endless cliffs and channel, plateaux of cliffs, and then the striking geoastic coastline. Rest, fish, swim, surf or enjoy a Hide picnic. At the end of the day, climb back to the pub and try one of their craft beers or as a passenger have one of the local ciders!! enjoy relaxed local cooking. Voted in the Top 10 pubs in Britain out of 52,000 by the Guardian.